I know that God is sovereign and good. He is able and willing to provide for His children and He does provide. So I’m trying to not be too upset. But Travis and I balanced our budget the other night, refiguring how much money we need for all of our different categories so that we can start putting $500 in savings every month for buying a house. As we looked at the budget, we started to realize that maybe buying a house this spring/summer isn’t possible for us. Well, it’s possible if we don’t want to put much or any down and we want a higher interest rate on our mortgage (turns out my credit might not be so hot because of stupid mistakes I made in college). We might just have to move into another apartment in Arvada/Wheat Ridge. At least that way, we would be closer to work and our friends, even if it’s still not a permanent residence. Adding insult to injury, Travis found out this morning that our car loan was denied. “What?!?! ?” I said. The guy at the bank did NOT say that this happening was even a possibility. He said that we had been approved for “x” at y% for a 2000 or older and approved for “z” at q% for a 2001 or newer. We were buying a 2001 so we thought we were good to go. Nope! I guess the bank sends some paperwork to someone else saying “We’re going to give these people this much money. Okay?” To which those people said, “NOT okay!” Travis said that the guy at the bank resubmitted the loan request, trying to appeal the denial. We find out this afternoon what happens. God is sovereign and if He wants us to get this car, we will get it–of that I am sure. And if we don’t get the car, I have to trust that God knows what He is doing by not letting us have a car. He’s working something out and it is positively for our good and joy in Him. It just makes me a little frustrated at myself because I’M the reason why we’re having this trouble. I paid my car loan late just one time but it’s still a “discrepancy” in the eyes of the lenders. And since the car we want to buy is “borderline,” meaning it is right on the cutoff between the loan rates and amounts, the lenders denied it. 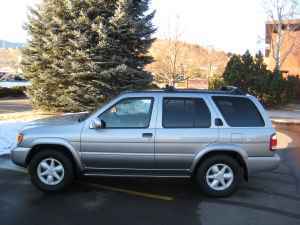 I’m praying every minute that God is delighting to give us the Pathfinder… it would be so amazing to have 2 cars again! We looked at a car this morning at 7:15. It is a 2001 silver Nissan Pathfinder with 80,000 miles. Travis found out about the SUV on craig’s list. The owner, Bill (we think), lives in Colorado Springs but was in Boulder for an audit (he’s a CPA). We looked at the car and engine–looked great. We drove it around–drove great. We took it to a mechanic to get checked out–it checked out. So we’re going to buy it! We’re so excited! The bank wasn’t open this morning (usbank doesn’t open until 9:00 AM–grrrr…) so we’re hopefully going to finalize the sale with the bank this weekend. We gave Bill $100 in cash as a “We’re really going to buy this” promise so that he would hold the vehicle. Travis and I had been planning on going skiing at Keystone on Saturday but we may either have to leave later in the day or go on Sunday instead. I vote for going later on Saturday but we’ll see how it works out. Praise the Lord for His faithfulness! We prayed for a quick deal and He delivered! So yesterday, I was almost convinced that I was pregnant. I have been having major mood swings, craving comfort food, my period hadn’t come when it was supposed to, and I got a major cold sore on my lip. But then I did get Aunt Flo so it turns out that I’m just an emotional and hormonal wreck who loves to eat! How ’bout that? The thought of me being pregnant was really exciting though and I’m kind of sad that it’s not real. It’s so weird that I am so anxious to have a baby. Before I became a Christian in college, I wasn’t sure I even wanted kids at all. After I became a Christian, I knew that I definitely wanted kids but not until I was in my late 20s. Then I got married and thought maybe after 5 years or so, kids would be a possibility. Now here I am, married for 8 months, and I want a baby NOW! But the thing keeping me from talking to Travis about the real possibility of having kids right now is that it just isn’t practical at this point. We are hopefully buying a second car this week and then a house this summer. Travis is still planning on going back to grad school in the fall and I just found out yesterday that I owe my parents $8,000 that I borrowed from them while I was in college. Add to that, I want to be a stay-at-home mom after having kids. So financially, a baby right now would really throw us for a loop. Lots of stuff in the works in the Kluthe household–buying a second car and buying a house. We spent almost all day last Saturday looking at cars. It was fun and exciting for a few hours but then around 5:00, I hit a wall and just wanted to go home. I am the kind of person who looks until I find something I like that I think is a good deal. Then I just go for it. Travis, on the other hand, is the kind of person who wants to research and inspect every little detail. I was in a bratty mood for a while when we were car shopping but finally, it was over! We’ve narrowed it down to about 2 cars but Travis is making the call. I’m pretty indifferent to which one we get–he can decide as long as I don’t have to go shopping for them again! Marriage is hard lately. I’ve been in a weird, cold, heartless funk. A lot of times I feel so indifferent toward Travis. I condemn myself for not feeling the way a newlywed is “supposed” to feel: giddy and in love. All I feel is reality–my life. It’s not floating in the clouds, everything’s coming up roses. It’s messy, chaotic, and busy. I started teaching English to a woman named Alma and we meet twice a week at her house in Erie. That has stretched the whole one-car thing to a new limit. We are more anxious than ever to get another car. I’m a little sad to get another car because it means less time that Travis and I will get to spend together. But it also means that we get some time apart, which I think will strengthen our marriage. You know the saying, “Absence makes the heart grow fonder.” I take Travis for granted a lot because I hardly ever experience his not being right next to me. It will be good to have some space so that we can appreciate our togetherness more.